15 years after the events of the first story, Georgetown policeman Bill Kinderman (GEORGE C SCOTT) is baffled by a series of murders that bare the marks of the Gemini Killer. Yet the Gemini was executed 15 years previously – on the very same night Kinderman saw priest Damien Karras (JASON MILLER) die after falling from a bedroom window during an exorcism on teenager Regan McNeil. Kinderman’s trail leads to the local hospital and a high-security isolation ward where a formally catatonic patient claims to be the Gemini Killer (BRAD DOURIF)…yet who looks exactly like Damien Karras. 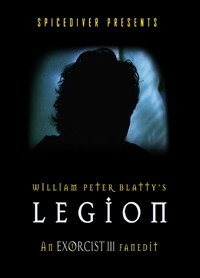 In 1990 writer/director William Peter Blatty shot a loose adaptation of his novel LEGION, misleadingly retitled and released as EXORCIST III. The film is an unusual, dialogue- driven blend of humour, police procedural and religious horror, a semi-sequel to his novel and screenplay of THE EXORCIST (1973). Spicediver’s reworking of the film is more in line with the low-key film that William Peter Blatty originally shot before studio-enforced changes. Although his shooting script was substantially different from both his novel and an early adapted screenplay, the studio infamously ordered its own changes after viewing his director’s cut. These included adding an awkward ‘exorcism’ subplot and ‘exorcist’ character – including an overblown finale – where none previously existed. The name was changed to EXORCIST III and all promotion and advertising of the film leaned heavily on the name and added theatrics. This fanedit removes the ill-fitting exorcism subplot and recreates the lower-key ending Blatty intended. No exorcism, no exorcist, no bug-eyed Fr. Karras or special effects mayhem. It also softens or fixes some inconsistencies, tightens some scenes, and ties the film more closely with the character of Fr Damien Karras from THE EXORCIST. While aiming to be faithful in spirit to the shooting script as it stood at the start of filming, that version of the script remains unpublished and all cut footage is now believed lost. The story therefore has been re-imagined with available materials. LEGION is about a different kind of demonic possession. Blatty never intended a repeat of THE EXORCIST and the story that he intended to tell in his director’s cut is not a movie for everyone. It’s character-driven, quirky, relatively low-key and it shuns theatrics in favour of dialogue, punctuated by occasional well-executed shocks. It is not a traditional horror film by any means and neither is it a traditional sequel. Its style and tone is very different from THE EXORCIST and viewers hoping for more of the same will be dissapointed. The studio tried to mimic some of that tone with its added exorcism and exorcist which Blatty later said was “… utterly unnecessary and changes the character of the piece”. Although most of the changes ordered by the studio hurt the film, one late decision actually improved it: the casting of Exorcist star Jason Miller. At first, all scenes in the isolation cell had been shot with Brad Dourif playing the possessed Father Karras and Blatty loved his performance. Forced to accept the recasting of Miller and faced with the unpleasant decision of replacing Dourif completely, Blatty hit upon the brilliant idea of using *both* actors to portray the two personalities inhabiting Karras’s body: who Kinderman actually sees (Karras) versus who kinderman is mostly talking to (The Gemini Killer). While all of Dourif’s scenes in the isolation cell were re-shot on a new set, the dual actor idea meant that most of Dourif’s mesmerising performance is preserved. NEWSFLASH! "Legion" fanedit debut public screening - presented by Brad Dourif! Star of Exorcist III Brad Dourif graciously agreed to attend a public screening of this fanedit at the Mad Monster Party horror convention that was held in Charlotte, North Carolina on March 25th 2012. Brad introduced the film and did a Q & A with the audience afterwards. Thank you to the crew at Mad Monster for approaching me with the idea and making this screening happen. I was honoured to be asked and how I wish I could have been there in person! Also check out Blatty’s book “Classic Screenplays – The Exorcist & Legion” (Faber & Faber, 1998) with an introduction by film critic Mark Kermode about the movie’s troubled production. This book contains an early Legion screenplay with an entirely different ending – where the Gemini Killer simply drops dead in his cell – and a related subplot about his abusive father in the form of childhood flashbacks. This published version never found studio financing and is *not* the Legion shooting script. 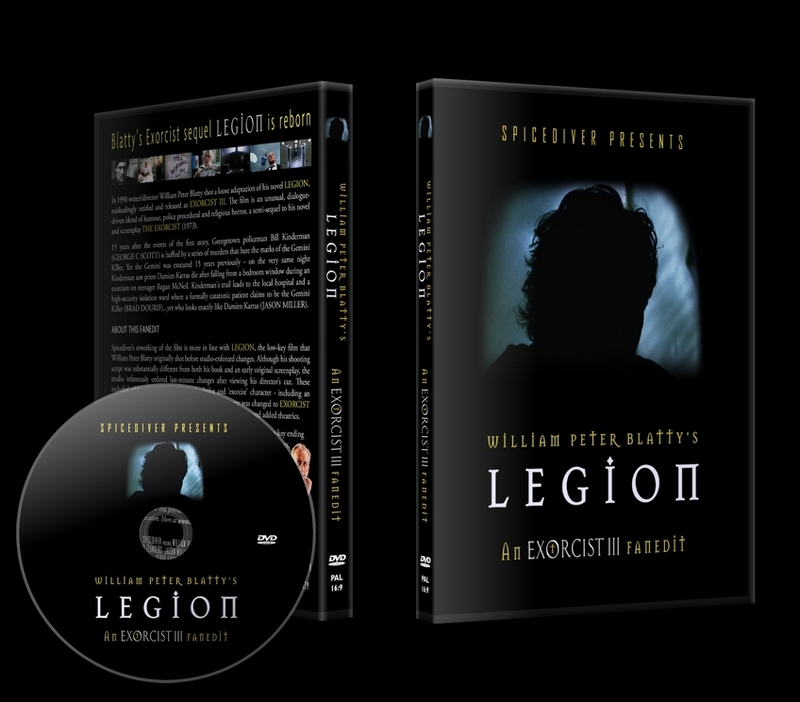 The DVD also contains the LEGION fanedit trailer. WHAT WOULD A DIRECTOR’S CUT LOOK LIKE? William Peter Blatty has long expressed a desire to assemble and release his original cut should Morgan Creek Productions ever find the lost footage. Conspiracy theorists will delight in the possibility that the cut footage is not really lost at all and that the studio is being less than truthful in the matter. Morgan Creek’s creative interference during production of both EXORCIST III and the fourth Exorcist film DOMINION/THE BEGINNING has seen the studio embarrass itself not just once but twice with the franchise. Pride and politics may be the problem here, not missing cans of celluloid. 1) No Jason Miller as Father Damien Karras. As hard as it may be to imagine now, in the original cut Karras is actually played by Brad Dourif – there is no switching back and forth between actors to symbolise the dual personalities inhabiting Karras body. Jason Miller was reportedly on a writing assignment at the time of casting, so Dourif got the part. To better connect LEGION with the first film, Blatty shot a prologue featuring Dourif as Karras’ in the final minutes of THE EXORCIST. Also shot for this same prologue was a scene where Kinderman (George C Scott, presumably without grey hair) views Karras’ body in the morgue. After he leaves we see a heart monitor, at first apparently silent, showing ominous signs of life. 2) The exhumation of Father Damien Karras’ body. This deleted scene in the local Jesuit cemetery belongs about halfway through the film. It was shot but for reasons unknown was left out of the final cut. The body is later discovered to be Brother Fain, an old Jesuit who was tending Karras’ body before burial and who disappeared from the priesthood 15 years ago. A follow-up scene where this plot point is uncovered by Kinderman and the Jesuit President may or may not have been filmed, too. The scene certainly exists in Blatty’s first screenplay adaption and one presumes it was in the shooting script, in order to give the exhumation scene some context. Snippets of the exhumation scene survive in the form of a “faked” funeral which closes EXORCIST III. The LEGION fanedit uses some of these shots too, but in a different way. 3) A different isolation cell. Publicity stills shot before late changes to the film show Dourif sitting in a sparse cell against a brick wall, obviously a different set.When Jason Miller was cast late in production all the isolation cell scenes were re-shot on a new set with both Miller and Dourif featured. Blatty was reportedly happy to reshoot anyway as he disliked the original cell. Dourif thought otherwise, saying he felt his best performances happened during the original shoot. Seeing Dourif’s fine performance in EXORCIST III, you might find it hard to imagine a better turn. 4) A different setting for the final scene. Given that the brick-walled cell seen in publicity stills was the setting in Blatty’s original cut, the final scene where Kinderman returns to the cell and executes Karras/The Gemini would also take place against this backdrop. As a horror film, Exorcist 3 has good bones - stellar acting, suspense over gore, intricate plotting and genuine bone-chilling scares. However, the studio's need to mold it into an Exorcist sequel caused one character to be played by two different actors and included a tacked on exorcism in the third act that feels forced and unearned. Spicediver's fanedit, Legion, is his effort to restore as much as possible what the movie would have been without the studio's influence. This is one of those fan edits in which the editor has a keen eye not to cut out material just because he can. There are subtle trims to the dialog throughout the movie, but this edit is careful not to step on the scenes that actually work in the original. While he is unable to fix the problem of two actors playing the same character, his version more accurately conveys Blatty's intent - that one actor is playing how the character looks, and the other is playing the entity that is controlling him. In the original, this distinction is harder to grasp. However, where this edit shines is in the execution of its third act. Seemingly impossible at the outset, Spicediver has managed to exorcise the exorcism (cute, right?) altogether without the slightest hint that something is missing. The edit changes the entire tone of the ending substituting spectacle for remorseless finality. In doing so, it creates an entirely new dimension of horror altogether - the tragic fate of Father Karras. This is an excellent edit, not only in being a taut horror film, but also as an example in demonstrating that sometimes insurmountable problems can be fixed in the right editor's hands. Audio / Video Quality: Great. There's no pixilation or noticeable blocking in the blacks, which is a prominent color in the film. Though, I do wish the edit was available in HD. Video: Seamless editing here. Nothing feels oddly inserted or missing. Audio: Excellent. There are no pops, dialog chopping or noticeable transitions in the soundtrack. Narrative: An improvement upon the original by bringing elements of the original to the front that were present but not prominent. Enjoyment: When it comes to horror films, if you enjoy tension more than bloodshed, and pondering over spectacle, this edit is for you. Exorcist 3 was a mildly interesting failure--the book Legion and the film adaptation shared the same weakness--mainly that they are way too talky. Anything in Exorcist 3 that a horror fan would actually want to see happens off-screen. If you want to see a movie in which a series of murders is described to you through dialogue then Exorcist 3 is definitely for you. William Peter Blatty actually came up with a pretty cool story--basically there are a series of grisly (or so we are told) murders and the trail eventually leads to the psych ward of a hospital which has a patient in solitary who is the splitting image of deceased Father Karras from The Exorcist. He also was admitted to the hospital around the same time that Karras. died. The mental patient knows details about the murders that only the killer could know but he's kept under strict lock-down, so how can he be the murderer? While the hospital patient is supposed to be the spitting image of Father Karras (Jason Miller) anytime there's dialogue he's played instead by Brad Dourif, which might seem odd but it turns out to be the best choice William Peter Blatty made. In Dourif's mouth the talky dialogue actually comes alive and the scenes become electrifying. The rest of the time the movie is generally a bit dull and way too restrained. It's a shame William Friedkin didn't direct this--restraint was never part of his cinematic vocabulary--it's likely he would have hit this one out of the park. I haven't seen the theatrical version since it played in theaters so I can't really compare it to the fan edit. I can say that Legion was much more entertaining than I remembered Exorcist 3 being but the new ending is pretty abrupt and unsatisfying--it's very possible that this ending is an improvement but I don't even remember the original ending so I definitely couldn't say. I would recommend this fan edit of Exorcist 3 but viewers shouldn't expect a lost classic because the original movie really wasn't very good. My favorite fan edits usually take a pretty good movie and make it even more enjoyable and I think spicediver has done just that with this edit. I was already a pretty big fan of The Exorcist III. I think it's a very good looking movie with some terrific performances. The film only has a couple of really big scares, but I think the atmosphere and buildup to those moments makes them all the more effective. The original Alien does a similar slow buildup to create tension. Spicediver has made a few simple, but effective changes to the film, that I think work very well. The ending does feel a little rushed, but I know that he only had so much source material to work with. I highly recommended this edit to any fan of The Exorcist III. Fantastic edit of one of my favorite films. The extended flashback to the first film at the beginning works a lot better than the quicker version in the original edit, and the new ending is just awesome. I never outright hated the original "flashy exorcism" ending, but it was always something that seemed so utterly pointless, especially considering the rather low-key film that preceded it. Obviously due to the limited material at hand the new ending doesn't quite deliver the emotional end the film is building towards, but it's much more in line with the rest of the film than the studio-imposed ending. This was a fantastic fanedit! I hadn't seen Exorcist III until last week and I rather enjoyed it but this version is infinitely better. Without a doubt this is replaces Exorcist III for me. The A/V quality is excellent. All the editing is perfect. As one reviewer pointed out, this feels like an official cut of a movie, which not every fanedit (unfortunately) acheives. I loved the new beginning and simple ending.